This project is called GI Learner. It's called DLAB, which is short for Digital Learning across Boundaries. 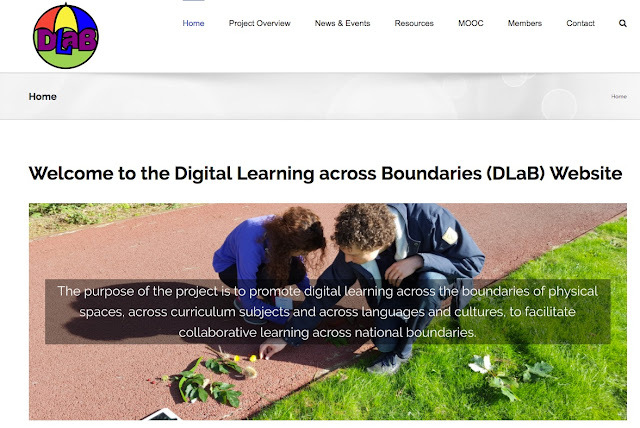 The Digital Learning Across Boundaries (DLAB) project addresses the need to align European educational practice with ways in which digital technology is changing how and what we learn, and how we apply this in education. The purpose of this project is to promote digital learning across the boundaries of physical spaces, across curriculum subjects and across languages and cultures, to facilitate collaborative learning across national boundaries. Technology Outdoors: bridging formal and informal learning by extending learning beyond traditional classroom spaces and supporting learners with disadvantaged backgrounds by managing transitions positively through collaborative outdoor learning experiences. Stem to SteAm: adding the Arts to the integrated study of Science, Technology, Engineering and Maths creating inter-disciplinary challenge-based online learning resources. The website is taking shape, and has a range of materials.